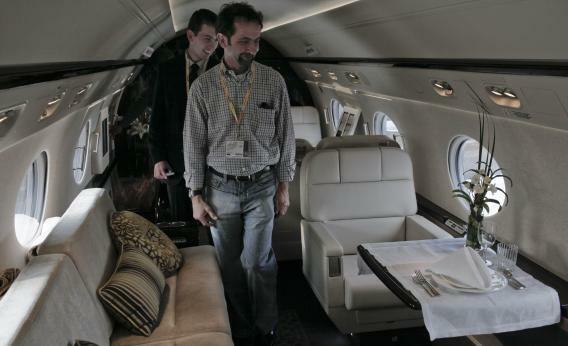 Visitors tour inside the cabin of a commercial jet made by American aircraft maker Gulfstream model on sale for USD 36 million, during the opening day of the 7th Latin American business aviation fair, at Congonhas domestic airport, in Sao Paulo, Brazil, on August 12, 2010. Via Scott Sumner, it seems that part of the deal to renew the Export-Import Bank is that it will now start subsidizing the production of private jets. The backstory here is that it had become a source of embarassment to the Export-Import Bank that its primary function was to provide subsidies to Boeing. It’s embarassing in part because “Export-Import Bank” sounds like a grand function whereas “funnel some subsidies to Boeing” sounds awfully crass. But it also got the bank into a ton of hot water in Congress because Delta decided to link up with tea party sentiment and try to kill the thing off. The problem from Delta’s perspective is that if you fly from Doha to Atlanta on a Boeing plane operated by Delta, the airfare is an export whereas if it’s a Qatar Airways flight the plane is the export. So basically the Ex-Im Bank was subsidizing Boeing in such a way that some of the incidence of the subsidy accrued to Delta’s competitors. At any rate, after a long and tedious congressional debate the reauthorization wound up happening on a broad bipartisan vote and now we get the corporate jet announcement. The problem here is that while diversifying away from Boeing is less of a problem for Delta, helps “spread the jobs around” geographically to expand the Bank’s constituency, and arguably sounds less ridiculous it makes less sense as policy. The thing about big passenger jets is that only two companies in the world make them—Boeing and Airbus. Right now both get implicit and explicit subsidies from their government backers. If Boeing were to go out of business and leave Airbus as a monopoly provider they could start earning monopoly prices and still have ample downward price flexibility to scare new entrants off from entering a market with huge startup costs. I’m not sure that persuades me that subsidizing Boeing is a great idea, but I think it’s arguable. In the best case, the US and EU would mutually disarm in the subsidy war (though this is logistically difficult since a large share of Airbus is owned by the French state) but fighting corporate welfare with corporate welfare isn’t crazy. But this logic doesn’t apply to the market for business jets where there’s much more competition. Bank Chairman Fred Hochberg names the existence of competition from Embraer and Bombardier as a key reason to subsidize Cessna, Gulfstream, and Hawker-Beechcraft but just writing that sentence confirms that there’s no looming monopolization. There’s also Dassault Aviation out of France, and the fact that it would be relatively easy for Boeing and Airbus to enter this market if it started to become profitable. Instead the rationale is that Ex-Im needs to subsidize the U.S.-based business jet makers “to help an industry where demand has suffered.” Now back last year the Obama administration was ranting against the evils of an implicit tax subsidy for the purchase of corporate jets, whose repeal would presumably only make this demand crisis deeper. And of course Obama’s general support of higher income taxes on rich people will further depress demand for corporate jets. So if the administration really thinks propping up this industry is a top policy priority, they’re doing a lot of things wrong.